Oysters: a big, salty surprise in a small package with flavor notes that depend solely on their place of origin. Shuck 'em yourself or get them grilled with toppings, it's all good. And in Atlanta, we don't let the fact that we're five hours away from the coast get in our way of a hearty dozen. 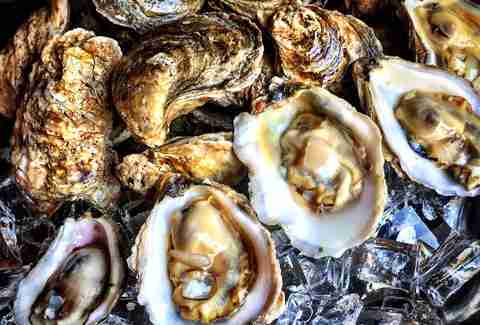 And now that the end of oyster season is nigh, we wanted to give you the best places around town to find the most robust oysters to get your slurp on -- with a few happy hour tips in between. Hidden in the beautiful Inman Park neighborhood, One Eared Stag is the perfect place for people looking for a chill yet sophisticated atmosphere. 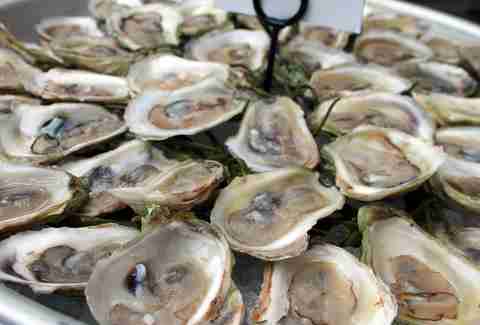 The selection of oysters is fairly small, but they pack a ton of flavor. They're served with crackers and mignonette. 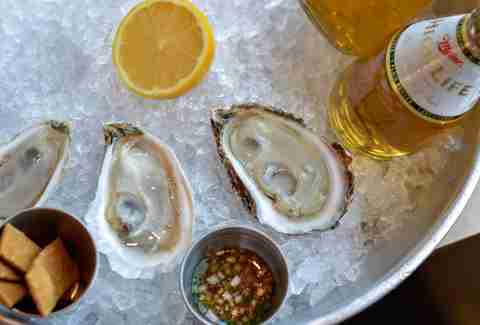 Happy hour at this spot is Monday through Friday from 5-7pm, and it's worth stopping by as $1 oysters come paired with a $1 hand-sized Miller High Life. At Lure, you'll get your choice of a raw selection or a shared plate of broiled oysters topped with mornay, andouille, and breadcrumbs. For raw oysters, the selection varies daily, and are all served with lemon, fresh horseradish, cocktail sauce, and shochu mignonette. If you’re craving oysters, but can’t settle on one kind, Kimball House is the spot for you. With one of the most extensive lists in Atlanta, Kimball House’s raw oyster menu is filled with oysters from Washington State, Virginia, Rhode Island, Massachusetts, and more. They all differ from heavy, salty notes, to citrus finishes. If you’re up for it, stop by their happy hour Monday through Friday from 5-7pm and pick up oysters for $1 to $1.50 a piece. Wash it all down with one of their famed absinthe cocktails. 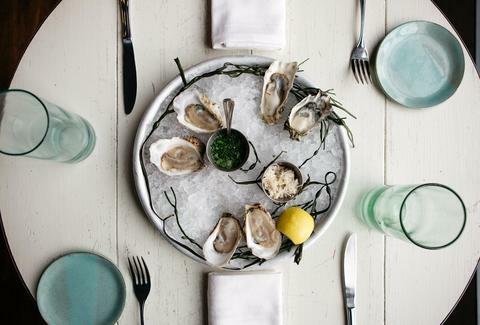 The Optimist’s oyster bar features a revolving selection of more than 10 breeds. And you can get ‘em raw or roasted in their wood fire oven. Stop by Monday through Friday from 5-6pm or Saturday and Sunday from 3-4pm for $1 oysters, or grab them for around $2.50 to $3 each on the off-hours. Pair your dozen with their daily punch for just $5 and finish up your night with a quick game of putt-putt outside. The Luminary’s oyster selection is as top-notch as the restaurant’s atmosphere. It has an extensive raw bar with rotating daily selections, all at market price. Make it a feast and add a side of Luminary's sapelo island clams for a full meal. While Goin’ Coastal isn’t on a lot of people’s radars (unfortunately), their baked oysters are some of the best in the city. Located in Virginia Highlands, the bivalves are inventive and flavorful. They come six per order, and you'd be wise to pick up the Rockefeller topped with spinach, bacon, and parmesan, or the crab stuffed oyster with blue crab and a mix of cheeses. The new kid on the block has already made an impression in most of Atlanta by adding to the local seafood scene. Sit on the patio or downstairs in the moody first come-first serve bar and pick a dozen of their well-priced oysters -- ranging from $2-$4 each. 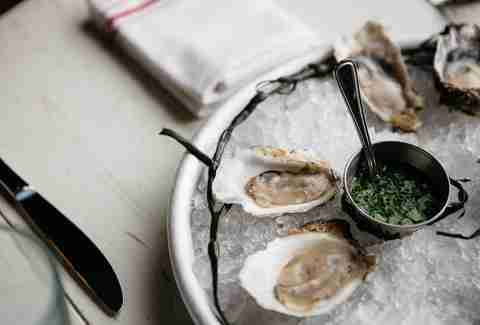 Their selection usually hovers at around 14 oyster variations, and be sure to sample their mignonette, it’s one of the best parts of their trays. Muriel Vega can’t wait to pair a dozen oysters with an ice cold beer this summer. Follow her shucking adventures at @murielvega.